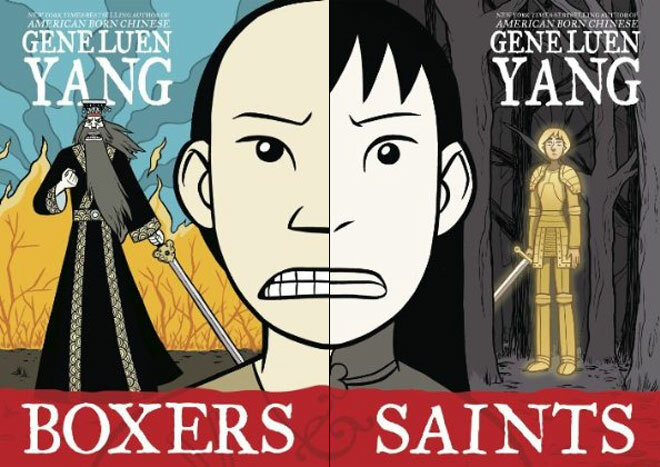 This two-volume graphic novel set by Gene Luen Yang looks at the Boxer Rebellion, the Chinese uprising in 1898 to 1901 against foreigners who had gained power in their country, from two perspectives. The first volume, Boxers, tells of a young man named Little Bao, who studies kung fu and calls on the power of the Chinese Gods to help him and other villagers throughout the countryside to take back their land. Saints is the story of Four-Girl, a young woman who, feeling disdain from her family, joins a community of Christians who give her a place and a name, Vibiana, as well as a guide in the spirit of Joan of Arc. By telling the story from two different sides of the conflict, Yang is clearly interested in helping readers see that right and wrong, good and bad are not always clear. We might support the idea that the Chinese should be in charge of China and not compelled to worship a God that seems false to them. But when we see how Vibiana finds community among the Western Christians, the question of whether the Christians should be there at all becomes murky. What’s bad for Little Bao is good for Vibiana. What makes the story even more interesting is that each narrative is, in itself, complex. Little Bao, the violent revolutionary, has crises of conscience about the bloodshed. But compassion is not easy to give, especially when the children he decides to free choose to fight back. Vibiana sides with the Western Christians in the conflict and longs to fight like Joan, but Joan fought to make her country whole. How can Vibiana, as a Christian and a woman, do that? Little Bao and friends transform into gods. 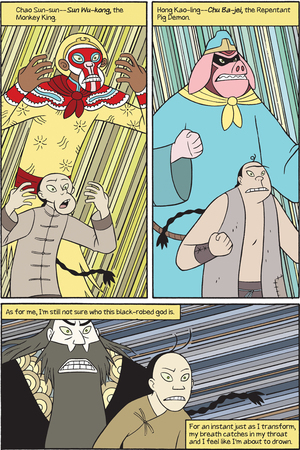 Yang’s art in Boxers is in color, using a palate of yellow, brown, and grey for most panels but bringing in brighter colors when Little Bao and his companions access the power of the gods. In Saints, the color is more muted throughout, using shades of black, brown, and white. The only bright color is the ethereal golden glow of Vibiana’s visions. I’m not sure why Yang decided to go with different palates for the two volumes. Saints is a more personal and less epic tale, which might explain his choice. But the fact that the supernatural elements are the most colorful elements of both books brought to my mind the notion that the heavenly realms are more real than our own. In these books, the visions are most definitely real, not figments of the characters’ imaginations. Both Little Bao and Vibiana have visions of people they knew nothing about before the visions. And so we have a world in which spirits are active, and the narrative never quite allows us to choose a side. In Boxers, the many gods do not always have the same ideas. And in Saints, Joan never gives Vibiana the straight answer she craves. Perhaps the closest thing to clear direction is offered in a pair of matching panels, one in each volume, where Little Bao and Vibiana receive guidance from new sources that they hadn’t paid much attention to before. Each book can work on its own, but the pairing enhances both stories. A few moments, including two encounters with the main characters, appear in both books. But Yang also provides a few mirror image narrative beats, in which each character experiences something similar, and the art in one book echoes the other. Although the volumes aren’t numbered, it is, I think, important to read Boxers first. The ending of Saints sort of wraps up both books, while raising more questions about the role of the gods in both stories. 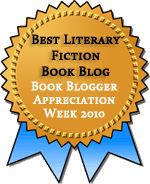 This post is part of Aarti’s More Diverse Universe event, celebrating books of speculative fiction by authors of color. This duo is just so nicely done. I’m excited that it’s nominated for the NBA, although I like a lot of the books on the shortlist! I can certainly see why this was nominated. I really liked Yang’s American Born Chinese and am very interested in reading more by him. This looks like a lot of fun, though I’d also like to try The Eternal Smile, which got the Eisner Award a couple years back. This reminded me of American Born Chinese in the way the two stories were braided together in ways that, once it’s all over, enhance the meaning of each of them. I’m so glad to see you reviewing this one for #Diversiverse. I’m a big fan of Yang’s work, and I read and loved this set earlier in the year. Wonderful! American-Born Chinese is the only other of his books that I’ve read, but I liked it a lot too. This sounds fascinating! I really don’t know much about the Boxer Rebellion, though I remember reading a British suspense novel where it was set in that place and time. Before reading this, the sum total of what I knew about the Boxer Rebellion came from Buffy the Vampire Slayer/Angel and a cursory reading of the Wikipedia page about it. So I learned a lot from this. I am so glad that you enjoyed these companion novels. Is it just me, or do companion novels seem to be becoming more popular now? They sound like such a great way to get two very different perspectives on an event that had so much emotional heft. I can’t think of any other companion novels like this, but I do really like the idea, especially with a story like this one, with two opposing sides getting some things right and some things wrong. It gets at the complexity of the conflict. The complexity of it impressed me a lot.